It occurred to me recently that i have never posted anything from the body shop on my blog! I am massive body shop fan so i thought it was about time i corrected this! I thought i'd start by posting my current body shop collection! Grapefruit and satsuma shower gel- satsuma is 100% my favourite its so fresh and fruity I'm obsessed! Grapefruit body mist and satsuma perfume- surprisingly the smaller one is more expensive as it s a perfume and the body mist is cheaper i don't find either incredibly long lasting but they do both smell incredible. Again with the satsuma this is probably my favourite product from body shop there sorbet they were only released last year but they are definitely a hit! they are perfect for cooling down in summer and i honestly love the texture! You can't really go wrong with body shop soaps they are smell amazing and are reasonably priced i think mango has to be my favourite soap, although i do love them all! Im not normally one for foot sprays of any sort but i love this especially in summer when you've been out walking all day a little spray of this and your feet feel lovely and fresh! I do also have a body butter which i can't find, I love the body shop products next on my list is try some of there make up range i have tried there bb cream and really wasn't a fan! I love the Grapefruit shower gel and body mist - perfect for this time of the year as they are so fresh smelling! I ADORE The Body Shop soaps - i practically buy them in bulk!! :) i should try their perfumes though, but Its sad they don't last long :( ah well. At least its small enough to be kept in a handbag! The Body Shop really have some amazing stuff! 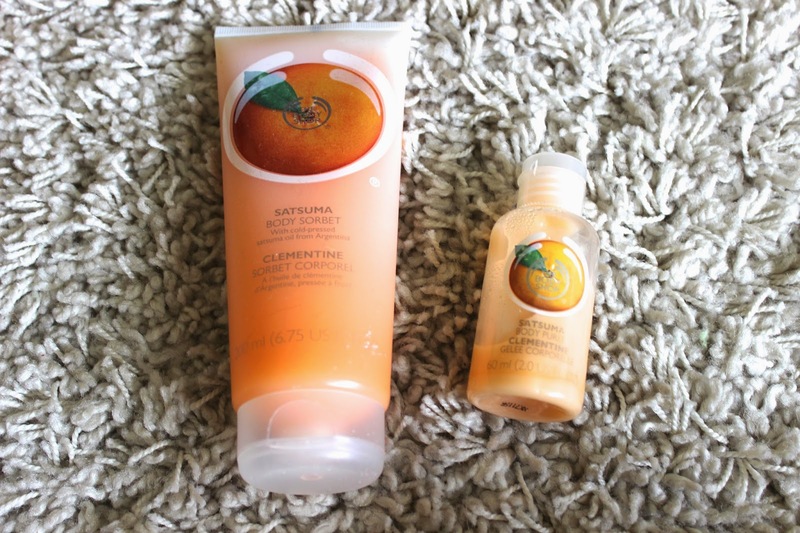 The satsuma range is the best, it smells so good! I've never tried their soap though, but they do sound good. The Body Shop is my absolute favourite shop for both skin care and body bits - I love their skin care Vitamin E range, every product is absolutely amazing! The Body Shop has so many great products , I just love it! I got a gift set for Christmas and I am so sad that it is running out and I can't find that one anywhere!